Pua and Mandua are like a couple of love struck teens, lol. They are both interested but both scared of each other. When one does get brave and makes a move the other freaks out. So in hind site I let these two get together to early. 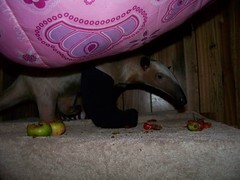 Pua was interested but Mandua took longer than expected to settle in and instead of being happy to see another anteater he would claw her from behind. When he finally settled in and got into Pua's space she was not into forgiving. At the moment they are both scared of each other. So the plan was to bandage up their claws and put them in a neutral corner together for some forced but safe contact and hope they realize the other is okay. Well, I have tried a few times over a couple nights and Mandua keeps popping out of his bandages like Houdini out of shackles bout soon as put on. 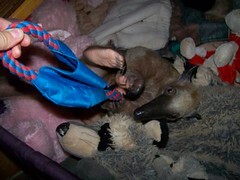 So I invented anteater boxing gloves out of 2 layers of old socks and some velcro. 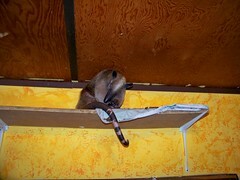 I thought she might just hook a back claw in and pull it off over her head but she not only wore them but climbed. I let her try out of curiosity but was ready to catch her. After she made it I removed them and added a 3rd layer. I tested them on myself then with a screw driver to my palm through the socks and no harm(yeah I'm a wee bit crazy). However when I tried them out the next night it did not go as well. Mandua just played and played and we had a long afternoon play too. 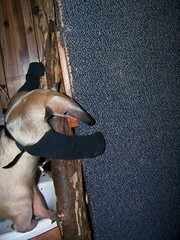 Well when Pua got up he figured putting the gloves on was play too and he had fun attacking the gloves. Once on and in the temp intro cage he was fine and just wanting out. Mandini struck again though and he got out but it was accidental. Adding the extra sock made them to bulky and he stepped on them and they came off, just as I got Pua done. So next night planned only the 2 socks each hand. It was fairly easy to synch them up that way. Since he was already in there though I stuck Pua in a crate and stuck her in there. Mandua was just tying to find a way out but got by her crate some. Once out it was back to play. 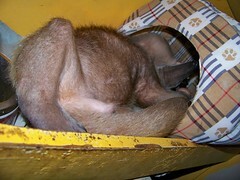 Mandua then passed out by his food. You'll need to turn the volume way up. 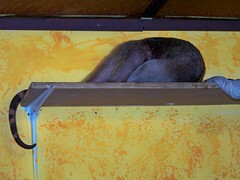 It's not much to look at but there you have it, an anteater snoring, though not quite what it sometimes is. I attached the socks to their harnesses. 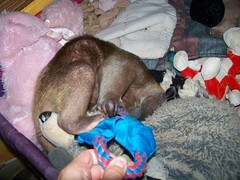 I had a little trouble getting the socks on over Pua's HUGE arms and the one came loose. I stuck the harness strap through a hole in the sock hoping it would stay but you see that failed. So I will reattach it more firmly and it should go better next time. Once freed. Pua went back to her ketchup bribe and then ate. Mandua played with me awhile. So no one was traumatized. The hope is over a few days they can spend more time together and realize the other is okay. So Pua won round one but was disqualified due to cheating, going gloveless during a gloved match. The BEST topic that I read all month! ?